The mythical Krakow is a major draw for any visit to Poland—but visiting in February is not for the faint of heart. The city's Wawel Castle is a major attraction for most visitors and Krakow's Old Town is home to impressive churches, plenty of museums, and Rynek Główny, the largest market square in Europe. Visiting in February means gloomy temperatures and gray days, but fortunately, the city is home to numerous indoor attractions so visitors can still enjoy the Polish culture while staying warm inside. The cold weather is also a good excuse to try out a new café and warm up with a coffee or tea. Krakow is extremely cold in February, albeit slightly warmer than January. The average temperature is just below freezing (28 degrees Fahrenheit, or -2 degrees Celsius) during this frigid and gloomy month, with temperatures at night dropping as low as 23 degrees Fahrenheit (-5 degrees Celsius). February is typically a dry month, with the city receiving just under an inch of rain throughout the month, but snow is more likely given that temperatures aren't likely to exceed freezing. Fog is also common in February, along with skies that are mostly gray and high winds. Adding to the extreme chilliness, sunshine is minimal too—expect just two hours of sunshine per day during February. Due to the frigid temperatures, a heavy winter coat is an absolute must in Krakow if you'll be spending any time outdoors. You'll also want to have a hat, gloves, scarf, and other accessories in your suitcase—all can be critical for protecting your skin from frostbite! Temperatures can rise slightly in Krakow during February, but you'll still want to follow tips for winter dress to protect yourself from cold temperatures that can be felt especially keenly at night and on cloudy days. Krakow isn't as bustling during February as it is at other times of the year, but the city still does host a few interesting events and holidays despite the freezing temperatures. While February isn't the month for lively festivals and annual events, there are typically concerts, theater performances, and other cultural activities that vary from year to year. 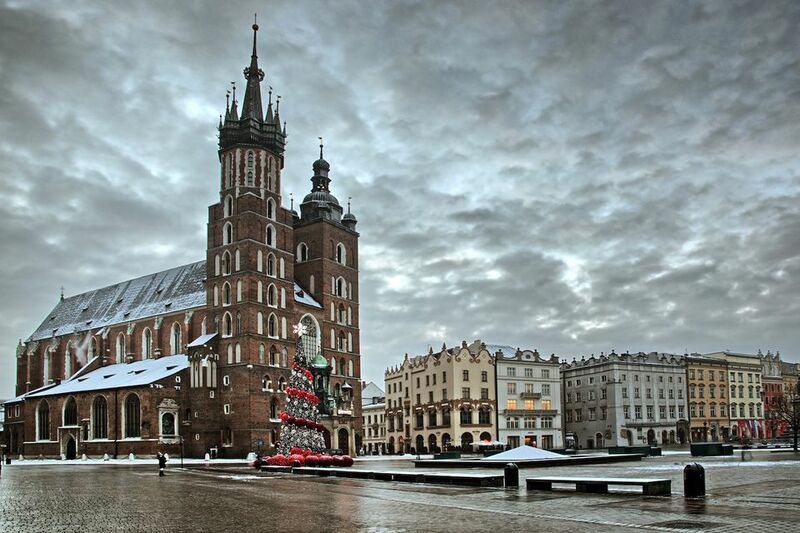 February 14: Krakow is a romantic setting in which to celebrate Valentine's Day with your loved one. Take a carriage ride, share a dessert in one of the historic restaurants on the main square, or shop for gifts for your sweetheart in the Cloth Hall. Sea Shanties Festival: Each February, this festival, also called the International Sailing Songs Festival, comes to Krakow to celebrate the tradition of sailor songs in Poland and elsewhere. Fat Thursday: Look out for Fat Thursday during this month, a day dedicated to eating sweets, especially pączki, traditional donuts filled with rose marmalade. You might also want to try faworki, a crisp pastry finger sprinkled with powdered sugar. Need a quick way to warm up if the air gets too cold? Ask for Polish honey vodka at any restaurant or bar. This slightly sweet alcoholic beverage goes down easy and is a Polish favorite. Krakow is just as safe as any other large European city. Use common sense, such as not carrying large amounts of money or showing off flashy jewelry and other valuables, and watch out for pick-pocketers in the city's more crowded and touristic areas. Poland's currency is the Polish zloty. Euros and U.S. dollars are not widely accepted, so be prepared. If you're looking for souvenirs to take home, look for traditional Polish goods, like amber jewelry (made of amber from the Baltic Sea), folk art such as needlework or Boleslawiec pottery, Wedel-brand chocolate, or Zubrowka, bison-grass vodka. Mead, the aforementioned Polish honey vodka, is popular as well. Some public toilets in Poland are marked differently than most visitors might be used to. While many have switched over to the commonly-used symbols, in some restrooms, the women's bathrooms are labeled with a circle and the men's with a triangle. Public toilets sometimes charge a small fee, typically around 50 cents USD.